During the Standby Phase, if a face-up card is in a Field Zone and this card is in your GY: You can Special Summon this card in Defense Position. You can only use this effect of “Doomking Balerdroch” once per turn. 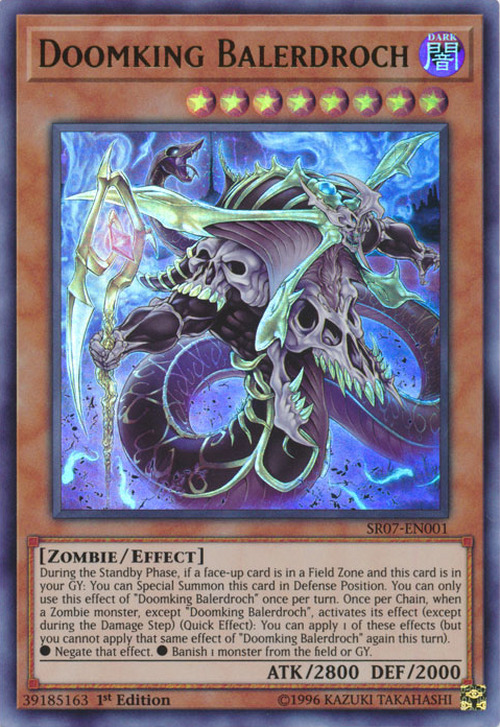 Once per Chain, when a Zombie monster, except “Doomking Balerdroch”, activates its effect (except during the Damage Step) (Quick Effect): You can apply 1 of these effects (but you cannot apply that same effect of “Doomking Balerdroch” again this turn). 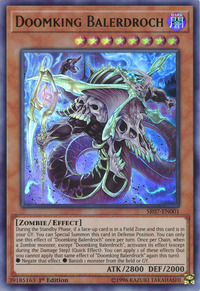 ● Negate that effect.● Banish 1 monster from the field or GY. Zombie World and Soul-Absorbing Bone Tower appears on this card's artwork. This monster appears in the card artwork of Zombie Power Struggle. Drochshúil is Gaelic for evil eye and appears in Celtic mythology.